Here are Vango’s range of quick pitching tents. These Vango tents are excellent when you quickly need some form of shelter either from the wind, sun or rain. They also make great garden camping tents so you and your loved ones can enjoy an night out in the “wilds” without really risking too much! There are five tents in this range, three pop up tents and two tepee tents. The three pop up tents in this range are the Dart, Dart DS and Swift. The Vango Dart has two models the Dart 200 (2 man tent) and the Dart 300 (3 man tent). It comes in 5 different colours – pink, camouflage, black/grey, green patter, olive/terracotta. Both the Dart 200 and the Dart 300 models are made of fire retardant material and have a hydrostatic head rating of 2000 mm. The Vango Dart DS also has 2 models in its range, the Dart DS 200 (2 person) and the bigger Dart DS 300 (3 person). The Dart DS 200 comes in 4 colours, pink, black/grey, light blue/dark blue and olive/terracotta. The Dart DS 300 is available in three colours black/grey, pink and blue. Both Dart DS tents are made of fire retardant material, have a hydrostatic head rating of 2000mm and are double skinned with a pre-attached inner tent. The Vango Swift 300 is the largest of Vango’s pop up tents. The 3 person tent is available in 2 colours, blue (see left) and light green with a red inner. The Vango Swift 300 is made from fire retardant material which has a hydro static head of 2000mm. With a bedroom and a living area, the Swift offers much more usable space but with the same simplicity of pitching and packing away as the Dart models. Vango Tents have seen the increase in popularity of tepee tents and its Tepee range have sought to meet this demand. 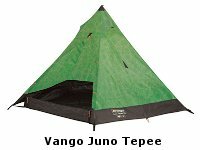 Vango have two design styles in its range, the Juno Tepee and the Peace Tepee. The Vango Juno Tepee is available in 3 sizes, the 300 (3 man tent), 500 (5 man tent) and 800 (8 man tent). It comes in 4 colours green, terracotta/green, pink and blue. The Juno is waterproof with a hydrostatic head of 1500mm which means it will keep you dry even at Glasonbury! The cool hippy feel to these tents means that you’ll stand out from the crowd. Well hey man the Vango Peace Tepee is a really far out tent and we think perfect as a festival tent. It comes in 3 sizes 300 (3 person tent), 500 (5 person tent) and 800 (8 person tent). There are no choices of colour, only the colour you see pictured to the left although we would like to see some more flowers on it. 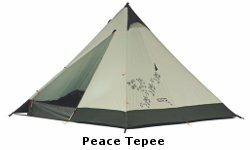 The Peace Tepee is made from polycotton fabric which has a waterproof rating of 1500mm. We think that the pop up tents and tepee tents are a lot of fun and a great entry level tent excellent for not too adventurous camping – perfect for festivals and overnight stays in the back garden. As these tents are quite seasonal and go in and out of stock very quickly it is difficult to pin down who will have these tents in stock at any given period. So we have made the job of searching easier for you with a list of retailers who have in the past stock either Vango pop up tents or other brands of pop up tents.